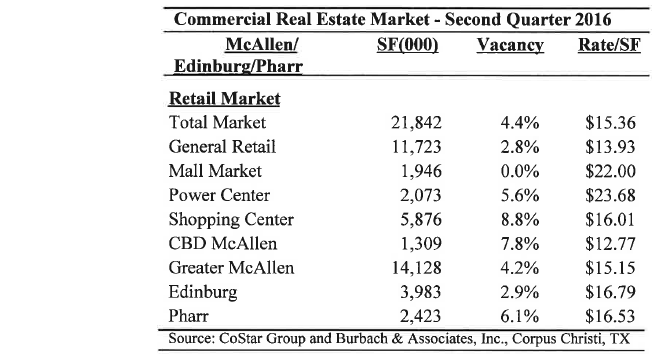 ​​​​McALLEN-EDINBURG-PHARR – The local retail market contained near 21.8 million sf as of second quarter 2016, according to Burbach & Associates and CoStar Group. The overall vacancy rate was 4.4 percent in 2Q 2016. The average total market rental rate was $15.36 per sf, with general retail showing $13.93 per sf. ​Be ​sure to shop around McAllen Market Research!